Members of the St. Ann Color Guard : Madeline Neff, Sydney Galvin, Kailynn Finnigan, Molly Hedderman, Trinity Willett, Kaylyn Mellace, Kassidy Taglieri, Maeghan Driscoll, Monica Lafferty, Amber Padgett, Kristen Padgett, Sarah Padgett, Samantha Hussey, Emilie Gray, Beverly Nguyen, Lexi Mallios, Meg Hauschildt, Alexia Hutchins, and Sydney Durfee. It’s been a season full of thrill and excitement for the color guard team at St. Ann’s of Neponset. Last month, the team members packed up their bags—and their flags—and traveled to Dayton, Ohio to participate alongside 12,000 others in the Sport of the Arts World Championships, an international competition for color guard teams and percussion ensembles. Meanwhile, at a ceremony in Stoneham on Sat., April 26, the team’s coach of 46 years, Eileen Cunningham, was inducted into the Massachusetts Drum Corps and Music Educators Hall of Fame. Cunningham, who has been involved with the team in some capacity or another for 49 years (she herself joined as a team member at age 12), said she and the other coaches organized the trip to Dayton because of the hard work they saw from the girls on the team. Three hundred guards and 200 percussion ensembles from over 40 states and four countries participated in this year’s championships, which took place April 3-5. The competition has been held annually since 1977. 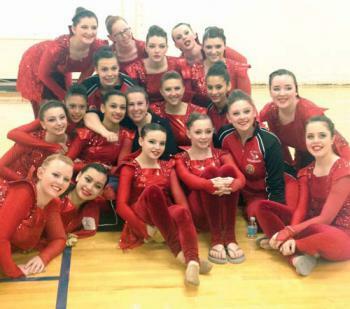 The St. Ann’s team, 19 girls ages 12-20, competed in the Independent A division of the event. Beginning in a preliminary round with a pool of 74 teams, they worked their way up to the semifinals on day two of the competition—and then to the third and final round, where they placed eighth. Madeline Neff, 15, has been on the team since she was 7. She said this competition was bigger than any she’d ever been to before. “It was an experience,” she said, of getting to see performances by guards from all around the world. Cunningham explained that performing at the World Championship level means that, with ten judges watching, each performer has eyes on her at all times. “It teaches them a lot of discipline,” she said. “It’s thousands of people that they’re performing in front of,” said Madeline’s mother, Janet Neff. She and other parents went along on the trip to cheer the team on. Throughout the tournament, she said, they all were nervous in anticipation, watching the team’s rankings go up and down as the team progressed. To qualify for the event, the team practiced three times a week, participated in local competitions on a weekly basis, and successfully made the cut at the regional Eastern Championships in West Long Branch, NJ on March 22 and 23. “It’s a huge confidence builder,” Neff said. She said she’s seen her daughter become more outgoing through the discipline of the sport. Perhaps that’s what keeps drawing girls to join the St. Ann’s team—and to keep with it—generation after generation. Now 36, Janet Neff was also on the team before her daughter. Cunningham, who coached her, too, said their story is not an unusual one. In fact, Cunningham’s own daughter marched with the team for 12 years. She has also taught several other relatives, including her brother’s granddaughter, 5, who started this past season.